The Rally Air is so awesome, it’s armor passes CE standards that don’t even exist yet! It’s a time traveling, skin and bone protecting, moto gear masterpiece. Constructed with a heavy duty Karbonite Kevlar Mesh, not only will the new Rally Air flow a ton of air, it’ll keep your epidermis from showing when you drop your shiny new R1200GSA. Large panels of Superfabric at the shoulder and elbow will offer extra slide protection while stretch panels will offer enhanced comfort and full range of motion. If you’re more worried about Sally SUV’s texting habits, Klim uses some of the most advanced reflective designs and materials that will ensure you are seen on the road, even on those moonless midnight rides. Impact protection comes in the form of D3O Xergo shoulder and elbow pieces, which meet the new CE Level 2 standards for limb protectors that haven’t even been officially announced yet. It also comes with Klim’s CE Level 2 D3O Viper Pro Back Protector, which is so good I use it in my Dainese Super Speed Textile Jacket. In addition, a detachable collar will accept a Leatt Neck Brace seamlessly. 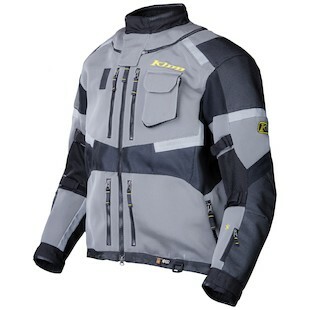 The Klim Adventure Rally Air has plenty of adventure accoutrements to go along with its futuristic armor. Eight external and two internal pockets will keep all your essentials within arms reach, while the hidden pocket will keep any unmentionables away from prying eyes. A hydration pack attaches to the back with room for a drinking hose that fits nicely to a clip on the chest. An integrated roll-top dry bag will keep your electronics from frying while the emergency ID pocket will identify you should the worst case scenario become reality. An adjustable kidney belt and internal harness will keep all this extra weight in place and comfortably distributed across your body. The Rally Air is rounded off with some Pittards Leather trim at the wrists and collar for added comfort, as well an internal moisture-wicking mesh liner. With all this airflow, the Rally Air by itself will not, of course, be waterproof. For those of you who enjoy all-weather adventuring, you’ll have to pick up the Rally Air Gore-Tex shell. It’s like a rain jacket on steroids, tailored to fit the Rally Air. 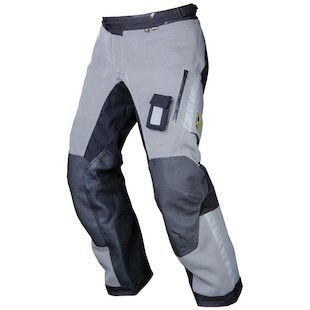 The Klim Adventure Rally Air Pants have many of the same features as the Rally Air Jacket, with a few tricks up it’s sleeves . . . or would it be pant legs? The same Karbonite Kevlar Mesh construction means your stems will get plenty of airflow but still remain protected in a slide. Leather panels inside the knee will keep you from getting burned, while reflective panels will keep you from becoming a victim of SMIDSY. If, however, the reflective panels don’t help you, the Rally Air Pants come with a full compliment of D3O CE2 Xergo armor in the knees and hips as well as Poron XRD Impact Foam on the tailbone. Two external thigh pockets will allow easy access while seated on the bike, as will the removable Spot pocket on the left thigh. As with the jacket, the pants come with an integrated suspender system and jacket-to-pant zip to keep your goods in place. If knee-high clodhoppers are your thing, the Rally Air Pants are equipped with a 500D Cordura boot buckle guard as well as an expandable cuff that allows you full access to your full-length boots. Falling in the line with the Rally Air Jacket, the Pants will also accept Klim’s Gore-Tex Over-Shell for those rainy days. The new Klim Rally suit fills a hole in our adventure-riding hearts. Up until now, if you wanted gnarly gear to tour the world on, you were stuck sweating bullets with only a handful of zip vents to cool you down. Enter the Rally Air - one half adventure suit and one half motocross jersey. No longer must you suffer the slings and arrows of outrageous summer heat!